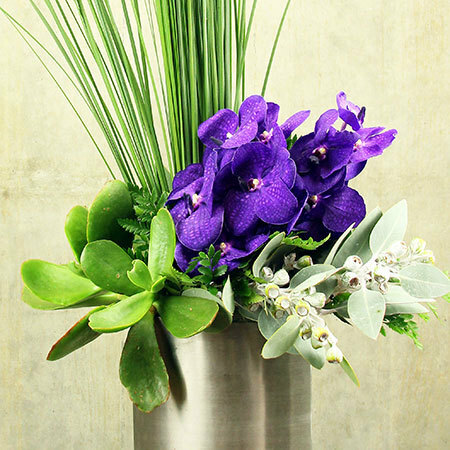 A stylish corporate flower arrangement in a modern steel-look vase filled with tall grasses, a variety of long lasting foliages in different textures and tones, modern succulents and a grouped mass of colourful, monochromatic tropical blooms. 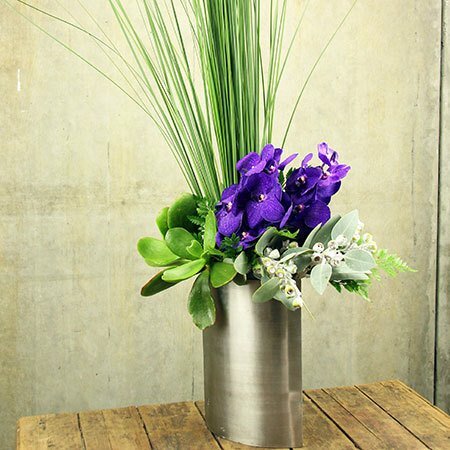 Perfect flowers for an office reception or retail space. *Please note: The type of flowers and foliage will be dependent on what is available from season to season. Colours can be customised based on your office decor. We deliver corporate flower arrangements to any commercial business on a weekly basis throughout the Sydney metro. The prices listed above can be used as a guideline, however we offer a fully personalised corporate flower service catered to your unique requirements and budget. Please call our team on 1800 66 66 46 or email sales@flowersforeveryone.com.au for assistance.